I consulted on the repair of a 259C Waveform Generator prototype that apparently never worked properly. This module has a principle oscillator based on the Thomas Henry X-4046 VCO, a waveform oscillator based on the Digisound80 which is a CEM3440 VCO with a 32 waveform EPROM, and a Serge wave multiplier. I believe it is a Vedic Scapes version based on the delta-shaped logo on the bottom left corner. 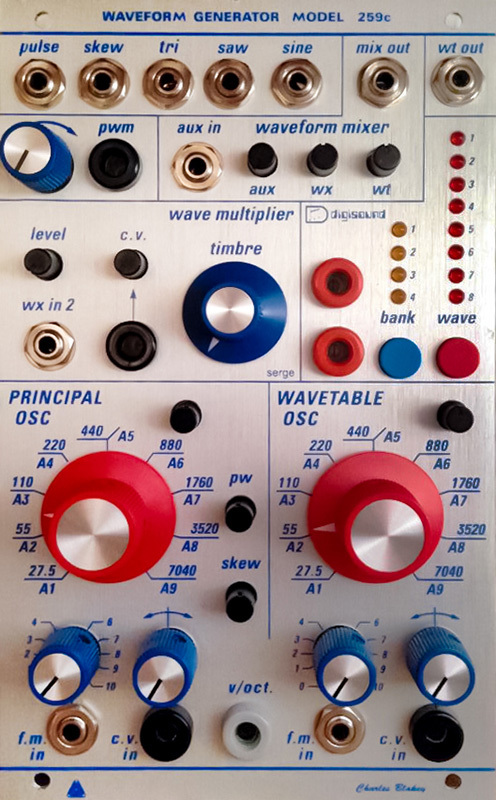 There is some information on the Muffwiggler topic Buchla 259c ? A mix between wavetable and analog. I know nothing more of this module.